Animal Hair Salon goes to SPACE! Join your favorite furry pets on their brand new and crazy cool style makeover adventures! Welcome to Space Animal Hair Salon Extravaganza! Leopard Amy, Pomeranian puppy Pepper, panda Pandora and giraffe Rachel got their spacesuits on and went off to explore hair styling and beauty trends on alien planets. Free your creativity and be the best animal hair stylist in the whole universe. You know what to do – wash, shampoo, rinse, dry, comb, cut, shave, dye and style hair. Dress up your hairy friends in crazy cute outer space clothes and design the coolest cosmic outfits! · Play makeover games with 4 super furry animals – leopard, Pomeranian puppy, panda and giraffe! · Leopard Amy is on a pink hair planet. Style her hair and create a fantasy space geisha look! · Help Pomeranian puppy Pepper look like his new tiny hairy alien friends from the ice cream planet! · Panda Pandora landed on a surfing planet, create her a wild and cool surfer’s look! · Dress up Giraffe Rachel – she is on the perfect planet for fashionistas with tons of space fashion items and crazy hairstyles! · Wash, cut, shave, comb, color and style fluffy fur and hair! · Make your own hair styling tools and hair dye! · Dress your favorite animals with colorful cosmic clothes and hair accessories! 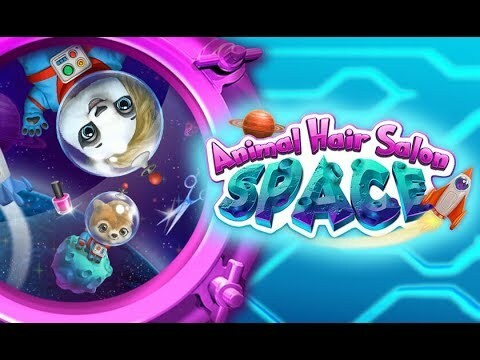 · Play Space Animal Hair Salon every day and collect space trophies!